Recently while driving through Midtown Atlanta on Peachtree Street, I noticed a very large banner hanging from The High Museum announcing an upcoming exhibit of Salvador Dali’s late works. As a teenager I attended a wonderful exhibition of Dalí’s jewelry creations in the Birmingham Museum of Art, and was captivated by his eccentric and remarkable art. My husband’s birthday was coming soon and I had been deliberating about something fun and different to give him for his birthday, Dalí and Dinner with friends! Perfect!! The High is to be the sole venue for the first exhibition to focus on Dalí’s art after 1940. The exhibition, featuring more than 100 works including 40 paintings and a related group of drawings, prints and other Dalí ephemera, explores the artist’s enduring fascination with science, optical effects and illusionism, and his surprising connections to artists of the 1960s and 1970s such as Andy Warhol, Roy Lichtenstein and Willem de Kooning. Many of Dali’s pieces during this time period were ruminations on his interest in Christianity, and several of the pieces depict events from varying periods in Biblical and Christian history including the crucifixion of Jesus, the assumption of Mary, and the spiritual visions of various saints. However, true to Dali’s eccentric nature and his surrealist roots, even his depictions of these once traditional subjects for the art world are filtered through his surrealist lens and provide a fresh look on the subject. Dali mixed his depictions of Christian themes with ideas and advancements in the realms of science and physics, subjects he was also increasingly fascinated by. As a result, many of the pieces he created during this time period he labeled as “nuclear mysticism” and they are truly as unique as this description suggests. These paintings are magnificent in their scope, beautiful in their compositions, and fantastic to be able to see in person, where one can truly be impressed with the sheer size of some of his canvases and, by extension, the size of his artistic vision. Salvador Dalí’ (1904-1989) born in Figures, Spain, is one of the most famous and controversial artists of the 20th century. He was prolific for more than 60 years, creating over 1,200 oil paintings, countless drawings, sculptures, jewelry, theatre and fashion designs, book illustrations and numerous writings. This exhibit is a treat not to be missed. Take a friend and be sure to get the audio tour also. After seeing the Dalí’ exhibit we had a delicious dinner at Parish in Inman Park with our friends and lots of interesting discussion after seeing these very eccentric and thought provoking works! My friend bought this replica of one of his jewelry pieces and I bought a book about Dalí. Dalí: The Late Work is currently on display through January 9, 2011. 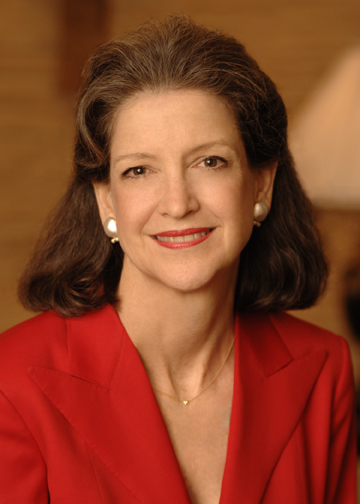 Please visit high.org for ticket prices and additional information. The home at 2035 Wenlok Trail is ready to be moved into. 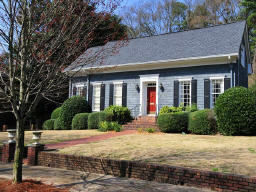 It has a versatile open floor plan and additional living space in the finished basement. The community of Stocktons Chase has a swim tennis club that will have you out meeting your new neighbors in no time! 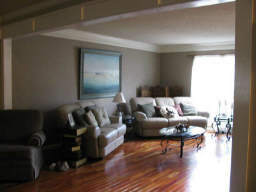 The main level has a connecting living and dining room that the current owners have expanded into a double living area. The rooms are very open, wide and spacious. There is a raised stone hearth with wood mantle in the back half of the combined rooms. 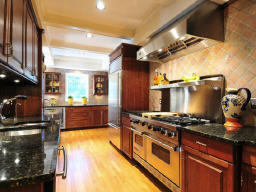 The kitchen has been updated with granite countertops and black appliances. The adjacent breakfast room has a vaulted ceiling and large bay window that looks onto a spectacular back deck. Stairs to the second floor rise out of the breakfast nook. 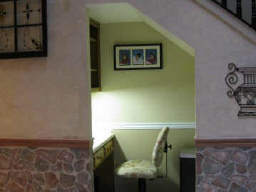 A surprising extra is a work area tucked neatly under the stairs with built-in desk and shelving. What a wonderful use of space! Keep your daily life running smoothly with everything right at your fingertips, but not set out in the middle of the room like many kitchen desks! The four bedrooms are all on the second floor. The master suite has a tray ceiling and a private bath. Separate sinks provide plenty of room for your morning routines. A single step leads to a whirlpool tub that is separate from the master shower. The room has neutral tile and will work with any décor. As mentioned earlier, the outdoor deck is wonderful. 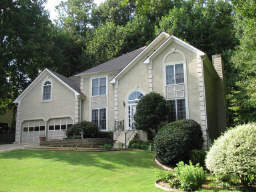 It is large and covers the majority of the back first level of the home. It is also wide, allowing for seating and dining areas. 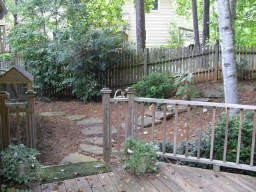 Step down off the deck onto stone pavers in a fenced backyard with well-established landscaping. Lots of opportunities inside and out to turn this home into your own! Built in 1990 by Bill Baker this stately brick home boasts an elegant designed and extraordinary craftsmanship. Nestled nicely on 1.32 acres in prestigious Tuxedo Park, you’ll find all that you could ever want inside and out. Lush lawns, majestic mature trees and shrubs greet you upon your arrival home. A double entry door and beautiful columns flanked by French doors welcome you in. The grand foyer features gleaming hardwood floors, flows nicely into a stunning living room offering a columned entry, fireplace with custom mantle and exquisite chandler lighting. A wall of French doors leading to the patio allow for ample natural light to fill this space, rendering a sophisticated yet comfortable atmosphere. A spacious dining room with hardwoods, crown molding, custom door casings and fireplace with mantle proves perfect for any dinning occasion large or small. The family room showcases a light and bright space with fireplace, tiled floors, rustic wooded beamed ceiling, built in shelves and cabinets great for your entertainment components and dual sets of French doors. Gathering here with family and friends will be a must. 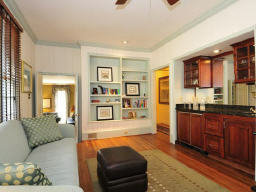 A renovated kitchen opens from the family room and is separated by a lovely breakfast bar. The kitchen hosts marble counter tops, stainless steel appliances, work station, cooktop island with stainless hood and walk-in pantry. The same tile that graces the great room flows seamlessly into the kitchen. This area is sure to be the entertaining hub of the home with its open and airy layout. The breakfast area will take your breath away with its three walls of windows overlooking the yard. Sit here and enjoy breakfast with the family or relax while drinking your morning coffee. When the day is done, a master suite fit for a king or queen waits on the main level. Here style and elegance combine with neutral wall tones, crown molding and excellent lighting. Relish in direct outdoor access through French doors and a sumptuous spa like master bath with double vanity and soothing soaking tub. This home also offers an indoor sport court, exercise room, media room, Ping-Pong room that opens to the pool and wine cellar all for your enjoyment. The main texture is an indoor sports court. Out back a sparkling in ground pool and spa surrounded by cherry blossom trees and wooded backdrop sets a captivating scene. 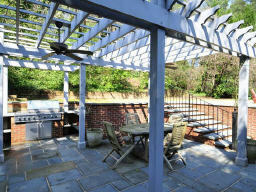 The covered patio overlooks the pool and provides plenty of entertaining space. Don’t miss your opportunity to call this exquisite home yours. Call today to schedule your private viewing!